Here’s a great airport amenity: a Winter Market. Each winter, Munich Airport turns the covered open space between the airport’s two terminals into a festive holiday market. 450 live Christmas trees plus one giant centerpiece tree help set the scene for the winter wonderland, with more than 46 stands selling charming gifts and yummy foods, such as mulled wine, sweet roasted almonds and gingerbread. Better yet, there’s a large skating rink in the center of the market and another ice surface just for curling. Santa Claus is scheduled to visit on December 6; on Saturday, December 19, Germany’s top figure skaters will perform on the ice; there’s live music on the weekends and hourly departures for the airport’s popular 50-minute twilight tours of the runways, fire stations, cargo terminal and maintenance hangars. 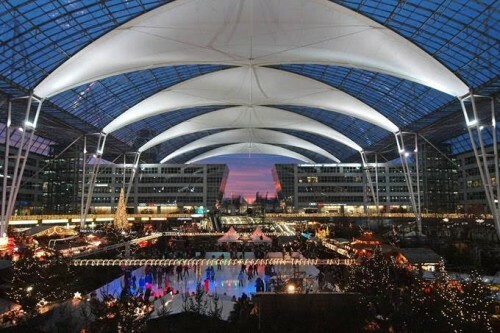 Here’s a link to more information and scheduled activities at Munich Airport’s Winter Market.